The rationale for GA4GH’s plans starts from the premise that genomics, a field to date primarily driven by research, is going to be driven by health care systems very soon. Whereas the research percentage of a country’s GDP may be at most 4%, the expenditure of a country’s budget in health care can be between 5-10 times more than what it spends on research. Given the impact that genomics is expected to have in the clinical setting, we can expect an explosion of genomic data production for the clinic in the coming years. The estimation by Birney et al is that by 2025 there will be at least 60 Million genomes sequenced, mostly for rare diseases and cancer. The only way in which all this data’s potential will be achieved is if all stakeholders come together to agree on standards, infrastructure and protocols for data sharing in a secure, transparent and efficient manner. This achievement is not just going to happen through the actions of key opinion leaders or corporations. Governments and international organisations will need to be involved. Thus, it is required that a harmonisation exists on the way genomics data is represented (e.g., formatting standards), kept safe (security standards) and reused (deidentification/reidentification) to protect patients and leverage its research potential. GA4GH aspires to drive some of these changes needed. In order to tackle the enormity of challenges posed by genomics applied to the clinic, GA4GH is working hard to orchestrate genomic standards across the world. The Matchmaker Exchange project, for example, tries to address the challenge of finding genetic causes for patients with rare diseases through a federated platform. Within the GA4GH, the Matchmaker Exchange constitutes what is called a Driver Project. GA4GH Driver Projects are ‘real world’ genomic data initiatives guiding the development efforts of standards and tools within the GA4GH. 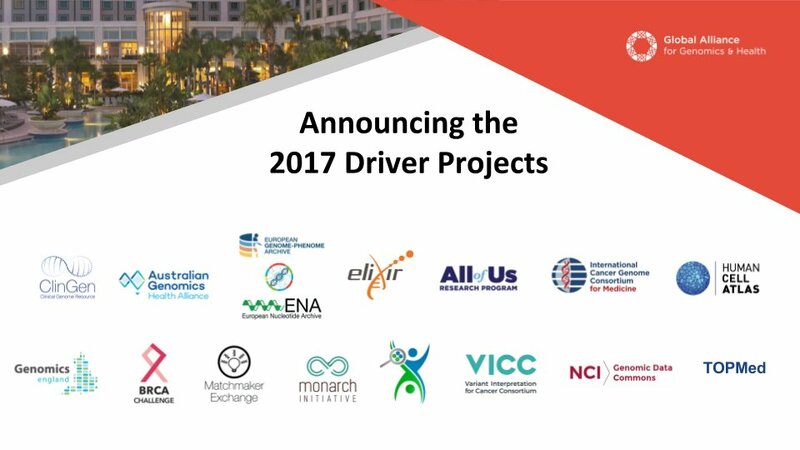 There are currently 15 driver projects, which include Genomics England, ELIXIR, TOPMed, the Human Cell Atlas, the Monarch Initiative, the BRCA Exchange, ClinGen, the All of Us Research Program and others. Figure 1 shows all current GA4GH driver projects, which were formally presented during day 2 of the plenary meeting, and publicly announced the following day. Driver projects are a mixture of both international (e.g., Matchmaker Exchange, BRCA Exchange, ELIXIR) and nationally-led projects (e.g., All of Us, Genomics England, Australian Genomics Health Alliance). Driver projects are cross sectional, that is, they include many of GA4GH’s Work Streams. Work streams provide practical standard and tool implementations for driver projects. Currently GA4GH develops six technical work streams (Discovery, Large-scale genomics, Data use and researcher IDs, Cloud, Genomic Knowledge Standards and Clinical and Phenomics Data Capture) and two foundational work streams (Regulatory & Ethics and Data Security). The Discovery Work Stream, for example, is dedicated to creating a unified data discovery platform to accelerate genomics and clinical data access. This work stream has been heavily involved in the development of beacons. The GA4GH Beacon project(https://beacon-network.org/# /) (Figure 2) allows any data centre in the world to make its data discoverable via this Beacon technology. 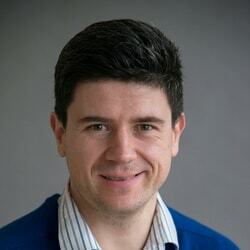 As Niklas Blomberg showed during his presentation on day 3, the ELIXIR driver project has used Beacon technology to provide discovery services for genomic data in the European Genome-phenome Archive (EGA) and other ELIXIR country Node data resources. The Regulatory and Ethics Work Stream (REWS), is another work stream which is not technical but touches every driver project. REWS, led by Bartha Knoppers, is concerned with ensuing data sharing being informed by patients/participants with clarification of data protection rules. REWS has a strong outreach and public engagement component, embodied by the initiative ['Your DNA Your Say'https://surveys.genomethics.org/survey/yourdnayoursay?_=1) by Dr Anna Middleton. REWS also has a strong component of advocacy, heavily influencing GA4GH’s public positioning by the promotion of the human right to benefit from human genome research. 3 April 2016: GA4GH global engagement workshop, launch of BRCA exchange and… cherry blossom!